OneWeb builds satellite factory near Kennedy Space Center. With a schedule of launching every 21 days, there had better be a large enough facility for production and so it begins as this article from the Florida Sentinel reveals. 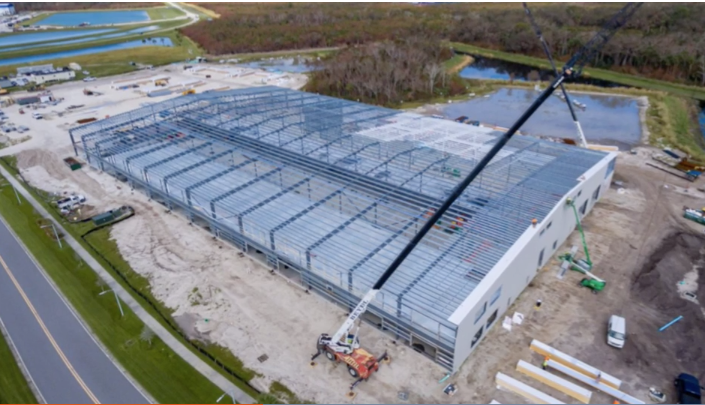 Construction on a new factory for OneWeb Satellites on Florida’s Space Coast is shaping up, even while the fledgling space company builds its first few satellites in France. OneWeb has joined with European jet manufacturer Airbus in a billion-dollar effort to launch upwards of 1,000 satellites to form a new communication network for the planet. The Sentinel broke the news about the company’s Florida plant in April 2016. The company’s CEO Greg Wyler tweeted a photo recently of the factory under construction next to Kennedy Space Center. He also updated an audience at the Satellite Innovation Symposium in California recently on the prototype satellites. “We are going to launch every 21 days over two years across multiple sites,” Wyler said, according to SpaceNews.com coverage of the symposium. The company is hiring at Cape Canaveral now, advertising for and antenna engineer, a radio frequency design engineer, and multiple manufacturing associates. The website says the manufacturing jobs only require a high school diploma, or GED equivalent, and three years of experience in manufacturing environment, among other things. OneWeb Satellites’ plant in Florida will be exactly like the one in Toulouse, France – where Airbus headquarters is – except it will have double the product capacity. The Florida plant will include two production lines, whereas the France location has one. In the meantime the company held its first launch drill at its Virginia control room, and rockets started arriving for the first launches – planned for next spring – at the Arianespace launch site in French Guiana. OneWeb has also teamed up with Jeff Bezos’ rocket company Blue Origin, which is building a rocket plant practically across the street from the OneWeb plant. They will build and launch satellites in Central Florida, reinforcing the foothold that private space flight is gaining in the region. OneWeb has contracted for five launches of its satellites on Blue Origin’s New Glenn rocket.Local manufacturing of satellites and rockets has been historically scarce in Florida. Plenty of contractors provide support, services, parts and engineering, but Cape Canaveral hasn’t been known for large-scale manufacturing. The two companies said they would hire, combined, about 550 people.